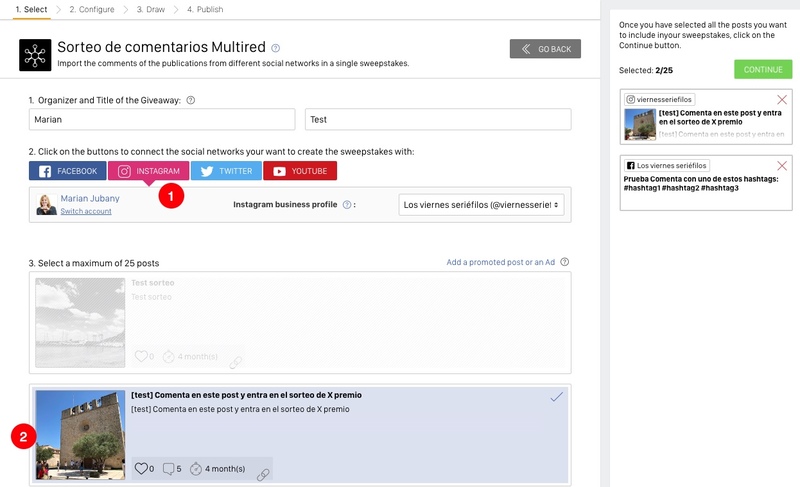 The Multi-Network Giveaway app lets you create a giveaway based on comments, from multiple posts, on multiple social networks. 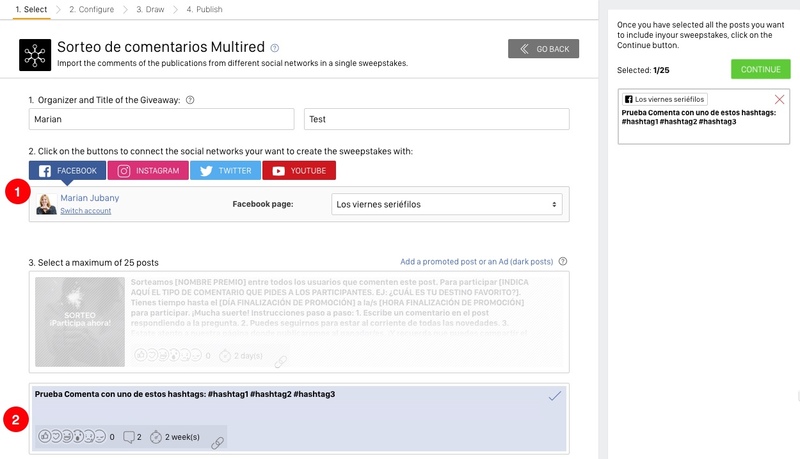 For example, you can run one giveaway for Facebook and Instagram users simultaneously, and choose a single winner. When you run a Multi-Network Giveaway, your first step should be to announce the campaign on your social media, and encourage followers to participate. Once the participation period is over, you can access your Easypromos Control Panel and create a Multi-Network Giveaway. The platform will import all the social media posts that you want to include in the giveaway. 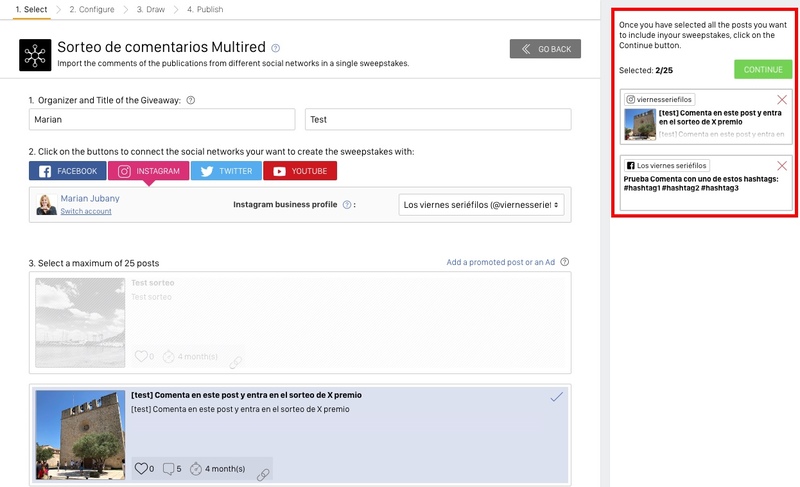 Finally, it will select and publish a winner from among the users who commented on your posts. The Multi-Network Giveaway application is currently only available to customers with an active Basic PRO plan or higher. 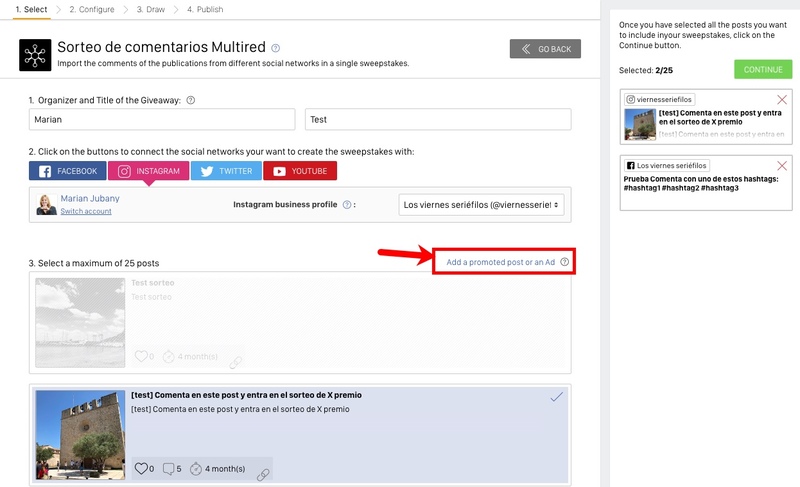 This tutorial describes the process of collecting posts and selecting a winner from multiple social networks. So you've announced a Multi-Network giveaway across your social networks, and your followers have had plenty of time to take part. The next important step is to select which posts to include in the giveaway, network by network. A winner will be selected from among all the commenters on all the imported posts. Here's an example to help you out. Important note! You can only import comments once. You cannot import more comments later. So make sure you don't open up the Easypromos platform until you are ready to choose the final winners of the giveaway! You will now find yourself on the main page of the giveaway. You'll see the title and ID of your promotion, as well as the number of participants and options to view their data. You can also access filtering and exclusion tools from this page. You can control which users enter the prize draw, and exclude any users who are not eligible. 1. Add any users engaging in bad practices to your blacklist. This will exclude them from all your Facebook Timeline contests, so you don’t have to exclude them manually each time. The blacklist is linked to your Easypromos Administrator Account, so it will be permanently available to you. 2. Exclusion of previous winners. Select this option if you don’t want users to be able to win more than one giveaway. 3. Exclusion entries registered after a certain date. In case of comments sweepstakes, this option allows you to indicate the closing date of the sweepstakes, so that users who participated after this date are not entered into the final draw. 4. Minimum number of characters in the comment. This option allows to exclude comments that don't have a minimum number of characters, which is established by the administrator when carrying out the draw. 5. Minimum number of commented posts. This option allows to filter users by the number of posts they have commented on. Note: This option is only available when all the publications selected for the draw are from the same network. Next, indicate how many winners and alternate winners you need. We recommend always choosing alternates, in case you cannot contact the winners or they have to be disqualified. Click 'Continue' and you'll be taken to the Test Page. From here, you can carry out a test to see how the giveaway will work and how the winners will be announced. Before you run the random sweepstakes, you have the option of carrying out tests to see how the tool works. Once you feel ready to choose a real winner, click "Ready! Pick the winners". The system will choose a winner, randomly and automatically. Congratulations! The sweepstakes has been carried out. The results will be displayed on your main giveaway page. Now you can think about announcing the winners publicly and awarding the prizes. Here you'll see the list of winners and alternates. You can manage prize winners, and change them if needed. Certificate of Validity. The Certificate of Validity confirms that the sweepstakes has been run once only, and completely at random. This certificate identifies the giveaway and it can't be modified. Share the URL to demonstrate that your sweepstakes was run fairly and transparently. Winners Page. This is a microsite where the names of the winners and alternates are displayed. Simply share this URL to announce the results. You can customize this page to match your branding and promotion aims. Broadcast mode. This option allows you to present the results of a giveaway in an animated format to show the winners in a more fun way and add a point of surprise and fun to your draws. This option is only available with the Basic PRO plan or higher. More information. 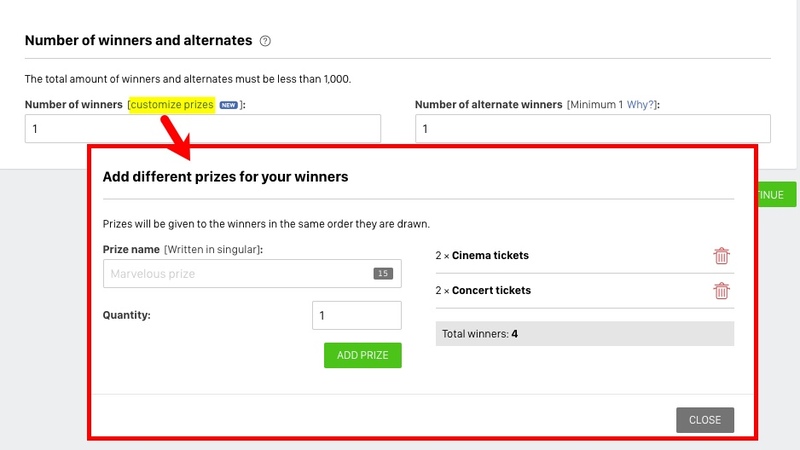 Set up this section to enable winners to confirm their details and claim their prize. Users simply visit the Winners Page to securely enter their details and accept their prize. This section offers tools to share the Winners Page on social media. You can also send direct notifications to winners. Download all the information provided by prizewinners as an Excel/CSV file.